Clearview masts manufactured from channel and I-section steel. Heavy duty mast chains. Guide roller bearings are sealed for life. Industrial class IIIB carriage, or bar carriage available for all masts. All carriages have side thrust rollers. Adjustable right hand tilt ram. flow 55 ltr/min (12.5gal/min). Pipe burst protection on mast hydraulics. 12v negative earth. 95Ah battery. 65 amp alternator. Full road lighting, direction indicators, hazard warning reverse and fog light. Auxiliary carriage services via hose reel for powered attachments. Wheel and tyres sets. Tinted cab glazing. Suspension seat. fenders. Reversing lights. Propshaft guards. Chaff guard. Air pre-cleaner. Engine fan guard kit. Hose guard kits. Load guard. Contact your local dealer for details of the comprehensive range of attachments. Safety quiet cab or canopy, FOPS standard (falling object protective structure) to FEM Section IV and ANSI B56.6 - 1978.
bars. Fitments include: velour seat, rear view mirror and 2 speed heater/demister. Front/Rear screen wiper and washer, horn. throttle, brake, and transmission disconnect pedal. Canopy: as above but with no glazing (screen wiper and heater/screen demister not applicable), and rear fenders are standard. mounted electric switch effortlessly controls machine direction changes allowing operator to keep hands on steering wheel. Automotive style pedal layout and conventional H-pattern gear lever add to ease of operation. Travel speed 29.0km/h (18mph). Front drive axle: JCB epicycle hub reduction drive axle with Max-Trac torque proportioning differentials. Rear steer axles: JCB manufacture with hydrostatic power steering. Steer shock valve as standard. 4WD versions with epicyclic hub reduction and Max-Trac torque proportioning differentials. 2WD versions have a deadsteer axle as standard. Service brakes: Hydraulically activated, self-adjusting, oil-immersed in-board multi-disc type in front axle. Parking brake: Hand operated disc brake on output of gearbox. 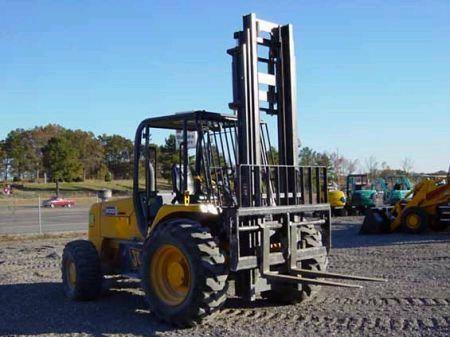 * Please call us with any questions about our forklift straight mast 21 foot 4wd rentals in Fallbrook CA, Temecula, Camp Pendleton, Bonsall, Escondido, Twentynine Palms and Northern San Diego County.